Scouting is an essential part of playing StarCraft 2 effectively. Last time in the Newbie Guide we discussed the need to learn about your units. You need to know how to make them and how to use them correctly. Armed with this knowledge, scouting becomes a powerful tool. If you can discover what units your opponent is making and you know all the unit counters in your head, then you have the ability to win the game. This is the basic idea behind scouting the enemy. Keep in mind that your opponent will constantly be scouting you as well. For example, if you discover he is making Siege Tanks you start building Immortals to counter. Your opponent may see your Immortals and counter them by making air units. Scouting is a constant game of back and forth. Once you understand your units, scouting is the number one thing that will help you win games. So, how should you scout? Well, I'm glad you asked. Do it early, do it often. Your first scouting unit will be a resource gatherer. No matter what your race you should be scouting before you have your first offensive unit. A lot of high level players send a resource harvester - Probe, SCV, Drone - to scout as soon as they begin construction on their first supply building. This doesn't always work for newbies because it's hard to tell what your opponent is up to that early in the game until you understand StarCraft 2 better. I would recommend sending a resource gatherer as a scout when you begin construction on your first offensive building. That would be a Gateway, Barracks, or Spawning Pool. Keep in mind it will take your unit some time to cross to the enemy position. If you send a scout too late you run the risk of walking into their first offensive unit and never getting a chance to see inside their base. With this first scout you are mainly looking for anything really weird with their build order. A prime example of this is if they don't have any buildings besides their starting structure. This means they are up to something tricky and want to win the game in the first 5-10 minutes. If this happens you need to figure out where they put their structures ASAP, because they may be sitting right outside your base. If your harvester gets into their base and their build order looks about even with yours, you shouldn't be as concerned. The other thing you want to look for at this stage is if they have any vespene geysers being harvested. If they are harvesting both gas geysers this early in the game it means they want to shoot up the tech tree as fast as they can. This can result in them rolling right over your units about 10 minutes down the line. The flip side of this coin is that they won't have as many units as you until they reach that point. If their harvesters are busy collecting vespene then there aren't as many collecting minerals. If you see the geysers being harvested early then you want to attack as soon as you possibly can. Be aggressive with your units. You should have more units than them because they are using their resources for buildings instead of units. The resource gatherer is merely your first scout. You need to constantly be scouting throughout the entire game. If they scout you and figure out what units you are creating, they can counter it. But, if you scout them back and see how they are countering you, you can tech switch and counter their counter. It's a game of back and forth. There are many tools at your disposal for scouting, but the two main ways you will find out information about your enemy are with your attack forces and with invisible units. When you attack an opponent pay attention to what units you are fighting. Simply by observing what units you fight you can tell what needs to be countered. This is especially true if you are able to attack all the way into the enemy base, since you can see what buildings from the tech tree your opponent has. What if your opponent has map control and you can't push to their base? That's when invisible units come in handy. 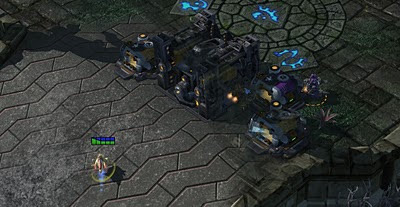 With Protoss use either Observers from the Robotics Facility or tech up to Dark Templars and build them from Gateways. Observers have better mobility - they are an air unit - and can be reached faster in the tech tree. Dark Templars are fun because, although they are ground only, they can one-hit-kill resource gatherers. Do a quick base scout with Dark Templars and then put them next to the mineral line to start devastating your opponent's economy. Terran have a couple different options too. Terran Banshees and Ghosts can both cloak while their energy lasts. If you manage to get a ghost in an enemy base - and have the right tech - you can nuke your opponent, which is always amusing. Terran Command Centers also have to ability to upgrade to an Orbital Command. With an Orbital Command you can scan anywhere on the entire map as long as you have the energy to do so. This is usually the best scouting option as a Terran. With Zerg you will need to rely on your attacking forces to do your scouting. In the early game you can use Overlords to scout expansion locations, but if they get killed you will lose some of your supply. Zerg also have the ability to burrow. If you have the units to spare, burrow one on each potential expansion spot. This will let you see if your opponent expands and - if you place your unit correctly - can prevent them from expanding at all. If you manage to sneak some zerglings into their mineral line you can always burrow and lie in wait to harass their resource gatherers at a later time. Xel'Naga watchtowers are a new edition to StarCraft 2. They're race neutral, all you need to do is park a unit next to a watchtower and you gain a large circle of sight. There are usually a few different Xel'Naga watchtowers on each map. They are represented by white squares on the mini-map. Expending one unit to each tower is usually a sound investment because they grant such a huge circle of sight. As with most things in StarCraft 2, the best way to get better at scouting is to practice. While you practice your scouting remember to scout early and scout often to stay ahead of your opponent. This blog looks so unique and cool visually. I love it! Thanks for taking the time to write this stuff up! I'll be checking back here often as everything I've read on here is written in terminology I can understand (until I get the sc lingo down).